Somehow we have ended up in March, almost as if February with its short number of days decided to sneak past us all. February is an important month for Feeding Edge as that is the birthday month. 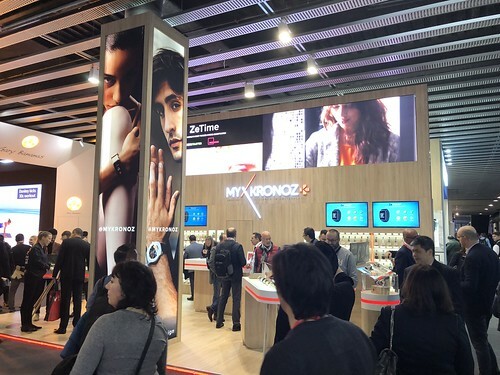 This 9th year I managed to not find the time to post and celebrate like every other year In part this is because of all the preparation for heading to Mobile World Congress this year in Barcelona. 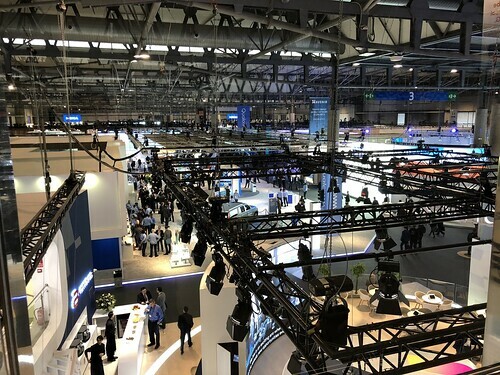 I had not had the chance to attend this show before, but this time my 451 Research and IoT and AR/VR analyst work took me there, along with a lot of my colleagues. The scale of the event and the major venue the Fira Gran in Barcelona was pretty amazing, 8 very large halls with a good 30 min walk from end to end if you didn’t stop or go into any halls. A major surprise was that it was very cold and snowed for the first time. Not ideal ! 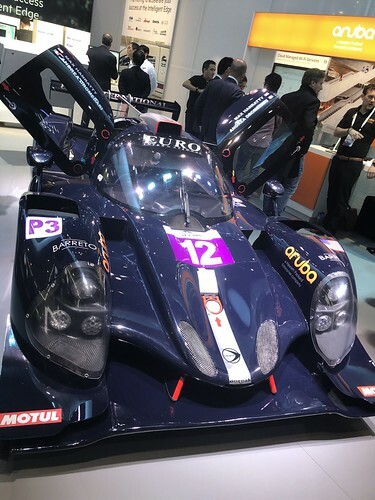 You may think of MWC as a mobile phone selling show but it is getting much more like CES with lots of huge stands and gadgets and of course cars. F1 had a significant presence too. 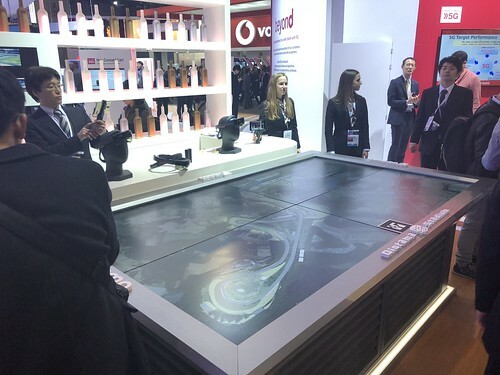 There was an awful lot of AR and VR on stands across the board, lots of 360 video such as Intel showing Shaun White’s gold winning winter olympic run. Makes one feel a little space out! 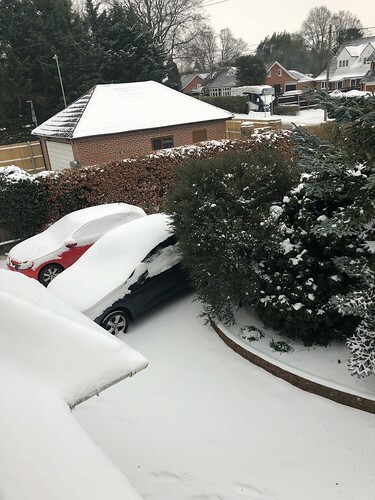 I nearly did not get home, and I know some other UK people actually didn’t so I think myself luck as we had snow. Lots of it for us. 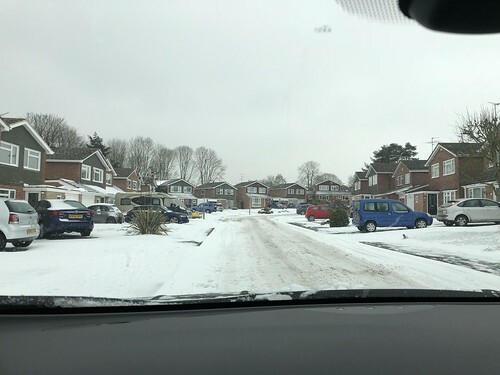 It meant driving the Nissan Leaf around to help Predlet 1.0 do her paper round, and one other round too for several hours on Basingstoke estate roads. So I think that makes a memorable belated 9th birthday. I will have to pay close attention to the decade of Feeding Edge next year, a bit more travel to do first though, Vegas, Japan, Hannover, Santa Clara takes me to June. Now if I can get everyone I meet to also just take a look at Reconfigure and Cont3xt and post a nice review that would be most useful. It may even help book 3 making its way from the back of my brain to the page. These years just tick away don’t they? Last year finished in a big rush of work with reports to get out before I took the rest of my holiday that was sitting there ready to expire. I was really please that I got my AR and VR long form report out for 415 customers. 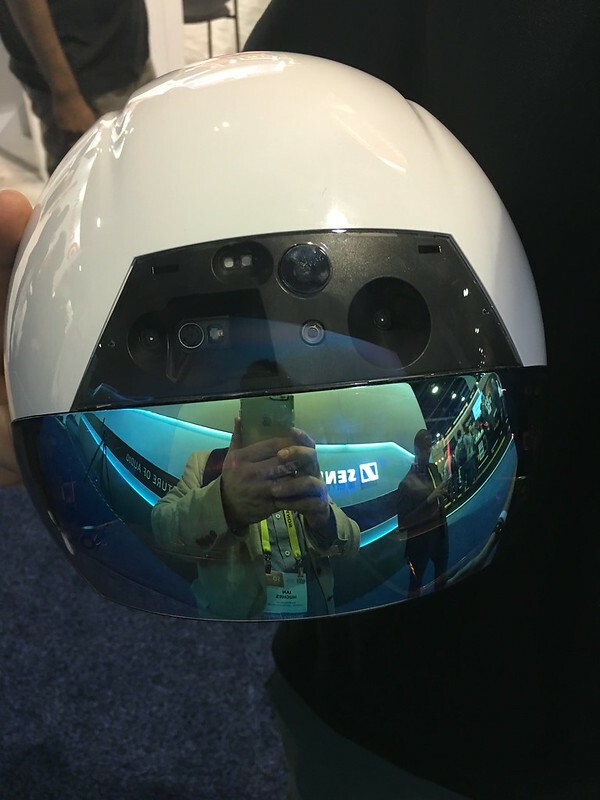 These a 6k or words and pictures but I was not expecting to be in a position to share Augmented and Virtual reality insights quite as much as I have this past year. It is what I know, and what I feel or course, but there are a lot more things in IoT especially in Industrial to try and stay on top of. However, AR is the UI for IoT, so there it is. It was over 18 years ago trying to get a shared avatar space of our offices working with presence of people, at the turn of the century! The along came Second Life, which made things a lot easier in 2006. 2017 was supposed to be the VR year, and it sort of was, but also AR is hot on its tail and finally Magic leap, on the 20th December unveiled their AR goggles.Yes, that was just a few days AFTER I managed to ship to AR/VR report with the words, “we shall have to wait and see what they do” in it. Though the shut down of Tango, which I did get in as an amendment waved the flag that would happen. We are also very close to Ready Player One hitting the screen, which will be the main point of reference for escapist VR with Spielberg directing. So it seems all the future thinking stuff we have all been doing is going mainstream to some degree or other. Apple ARKit and Google ARCore put AR tracking into the hands of everyone with every mainstream device too. So it looks like being a good year. 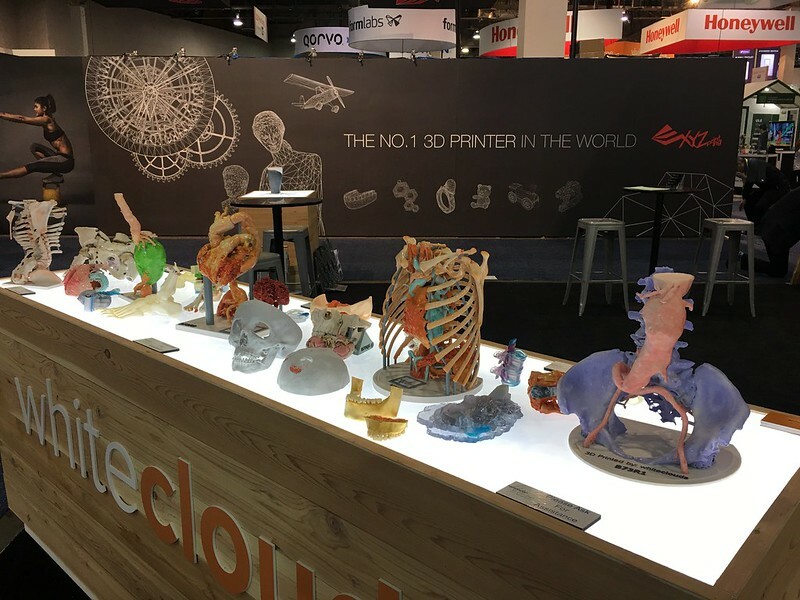 Reconfigure is the place to start there are some links on the right 🙂 Enjoy the future. 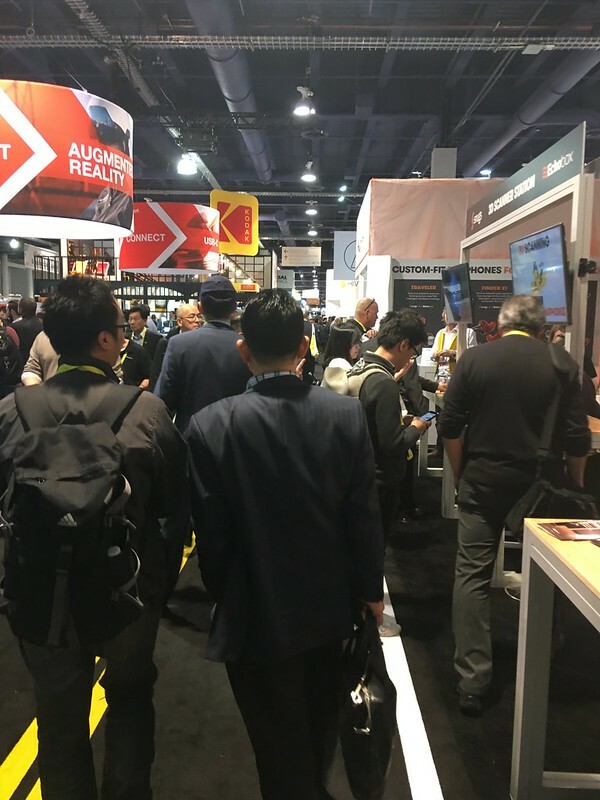 For many years I have seen the CES show appear in magazines, then TV and then of course all over social media. As a long time tech geek and early adopter I have always wanted to attend, but never been able to. In my corporate days getting approval for a train to London was a chore. As a startup I never had the time or money either, preferring to invest in the gadgets like the Oculus rift or paying for a Unity license so I could build things. 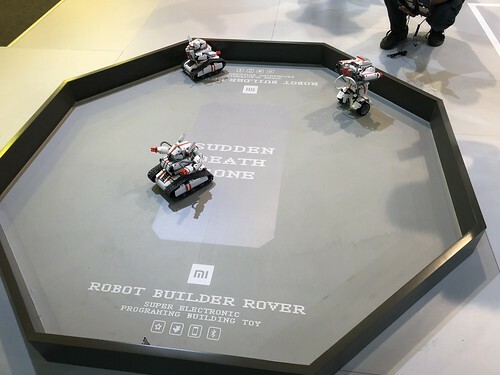 On the TV show we talked about CES, and if we had gone to a 4th series it was on the cards. 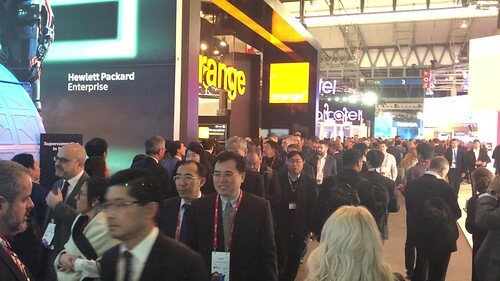 This year, with my industry analyst role in IoT I was able to go. Of course as a work trip it was a bit different to just being able to take the show in. I had briefing after briefing with a bit of travel time in between for the 2 main days I was there. Once thing that is not always obvious is just how big the show is. Firstly there is the Vegas convention centre with North and South Halls that is bigger than most airports. 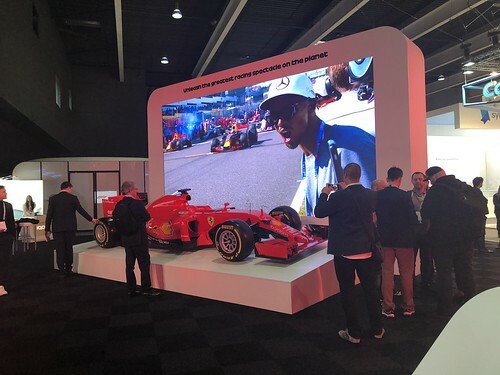 It was so big that I only got to really visit the south halls, the north hall of cars, a motor show in its own right alluded me. All the first days meeting were around the south halls. Day 2 was at the other areas of the show, the hotels have their own convention centres and also floors and suites get rented out. The Venetian Sands, Bellagio and Aria all had lots going on, each as big as any UK show it seemed. 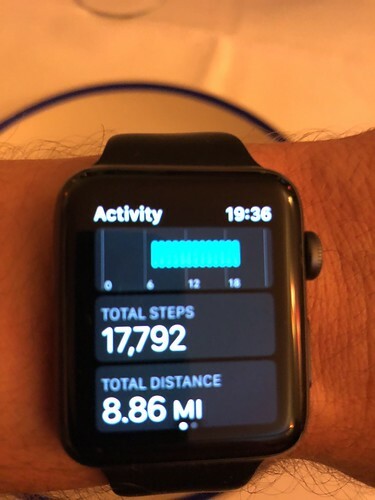 Walking around 9-10 miles a day, still not seeing everything, at a trade show gives you an indication of the size. Again I pretty much missed most of the expo floor with meetings but the day I felt out I had an hour to pop back to the Sands main hall and see some things. The split across the entire show of giant corporate powerhouses to tiny startups with a single table was amazing. I had assumed it was all the former, but the latter is heavily supported and with kickstarters and maker culture now mainstream it will continue to be really important. 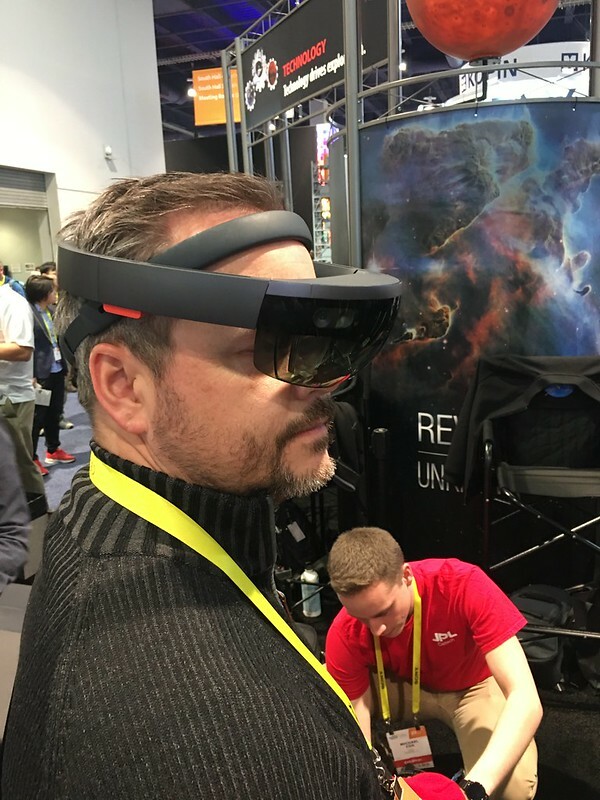 One thing I was there to see was how much Augmented Reality was taking off running parallel with the VR wave, there were a lot of glasses and of course the Hololens and the industrial focussed Daqri smart helmet. Still not there as a consumer focus really yet, though the Asus Zenfone AR powered by Tango and Qualcomm was announced but not on sale until later in the year (no date given) which may put true AR into people’s hands. 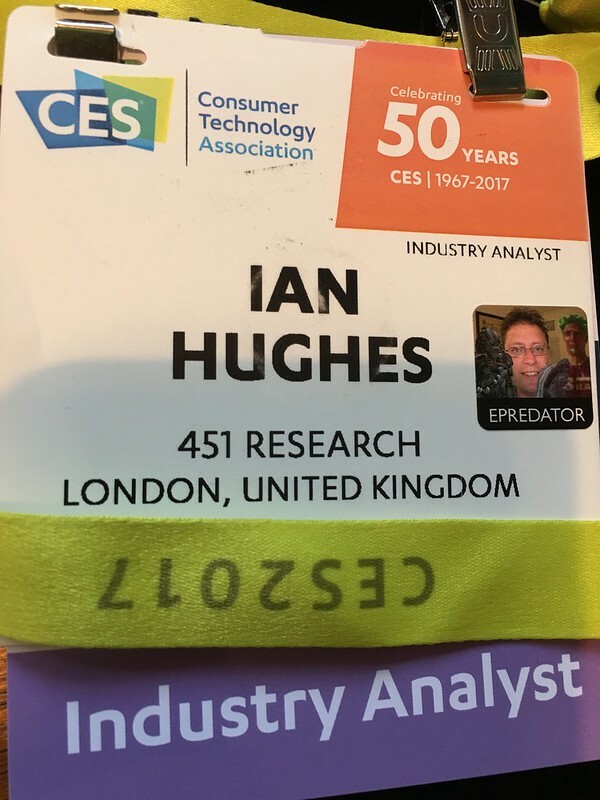 It was CES’s 50th anniversary, and that was fitting given I turn 50 this year too. It may not be the most exiting bucket list tick but I have already done lots of mine, and need to refresh the list anyway. 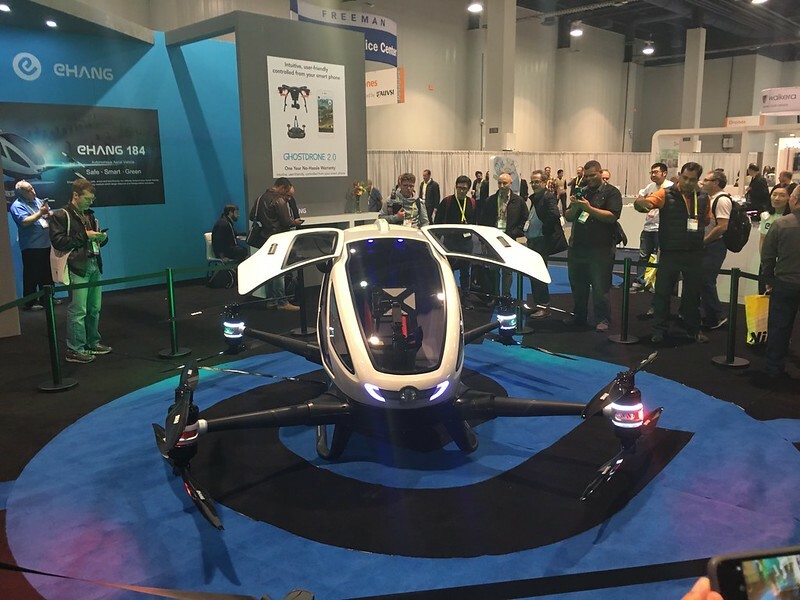 I am not sure that will include riding in this human size quad copter that you fly with a smart phone though! I guess we best experience everything before these guys and their bretheren take over. As you will see in this album the whole place just becomes a blur of everything looking the same, lights, sound, people, attract loops etc. All very fitting to be in Vegas. 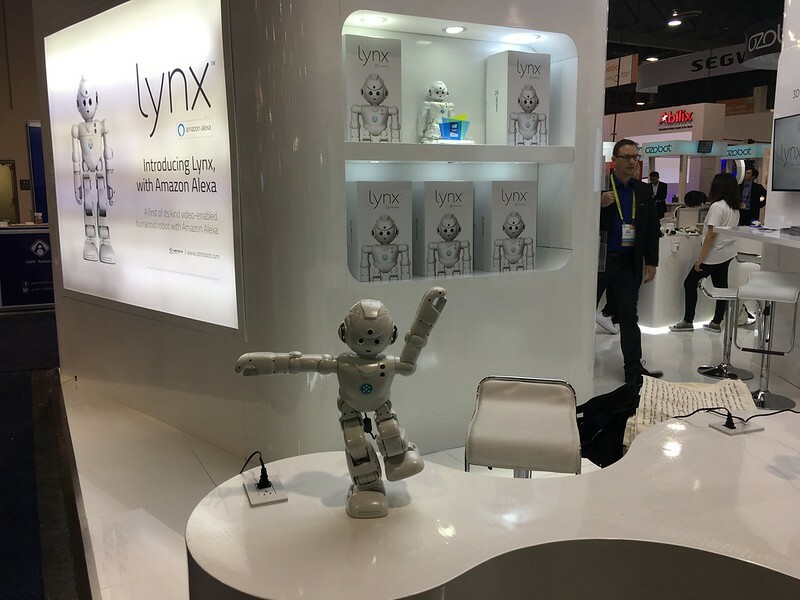 @xianrenaud and I wrote a spotlight piece for 451 Research as a show roundup which may end up outside the paywall CES 2017: connected, autonomous and virtual in case you do have access. So that made a whirlwind start to this year. This time last year I was published Cont3xt and wondering what the next steps were going to be. This year I have stacks of IoT research and writing work to get on with, a 50th birthday to not get worried about, imminent wisdom tooth removal (yuk) and all being well a 2nd Degree/Il Dan black belt text in Choi Kwang Do. So onwards and upwards. Pil Seung! I has been a few months since I wrote anything here. My new role at 451 Research has kept me doing a lot of writing about a lot of interesting subjects related to IoT. It is an interesting change to be on the receiving end of briefings where people tell me why their implementation or product direction is of interest, yes that’s bit poacher turned game keeper, but it is good to be able to share and build upon all my previous experience. The Internet of Things is huge and diverse, because like the internet it underpins everything. 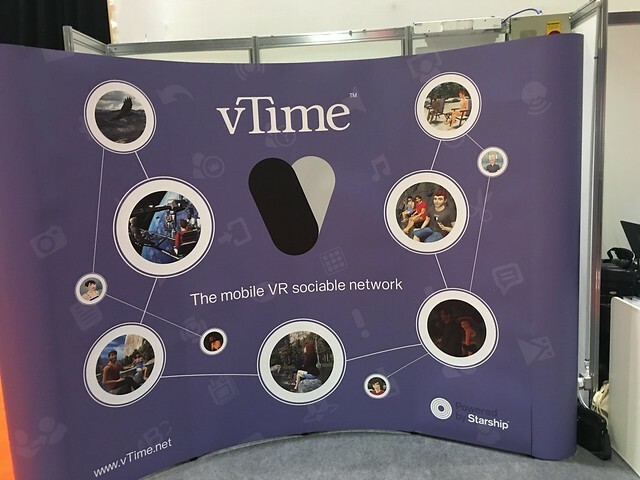 The great thing is it also include how we as people understand what is going on in a system, which lends itself to being able to discuss virtual and augmented reality. I had started to cover some VR and just posted a longer report spotlight on AR when Pokemon Go hit. It was only a matter of time before a mass market awareness thing happened, but few of us knew the form it would actually take. Most of what I write is behind the paywall for our customers, but somethings make their way outside. 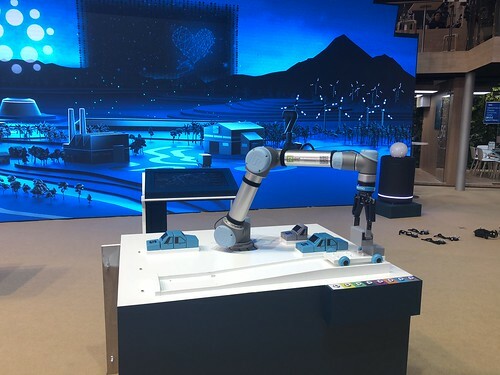 Firstly our AR report (as this was with @xianrenaud 451 Research IoT research director) made the home page and some free access to all. I was not in a position to write a whole report on Pokemon Go or its lack of real AR, but I did write an analyst note (our briefest piece of content). Which now is also on the homepage and free (linking back to the AR report). The VR report is still locked away but you can sign up for a trial account. AR and VR also featured in at the end of a recent IoT Webinar on Brightalk that Christian and Brian did. I provided a couple of pictures for that. I take the position that VR is great but it is an extension of current screen technology at its heart. A screen for each eye. 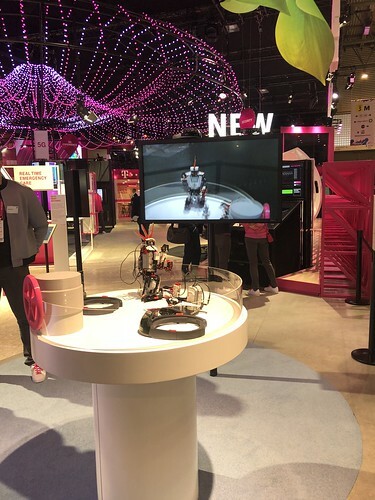 AR is a new departure, sensing the world and projection/translucent displays is a whole different ball game and one that had many more industrial and enterprise uses. Interestingly lots of AR tech is being retro fitted to VR. Nothing is ever clear cut, but its good to spot a trend or find a theory to explore. Of course my IoT VR and AR experiences blend into the books Reconfigure and even more so the follow up Cont3xt and the adventures are still selling and being downloaded at $0.99 around the World. A few more reviews would be great. In some of my briefings some of the elements I have used start to get a little closer to reality, but it was always supposed to be near real sci-fi. I have not thrown away my tech hands on approach to things though. 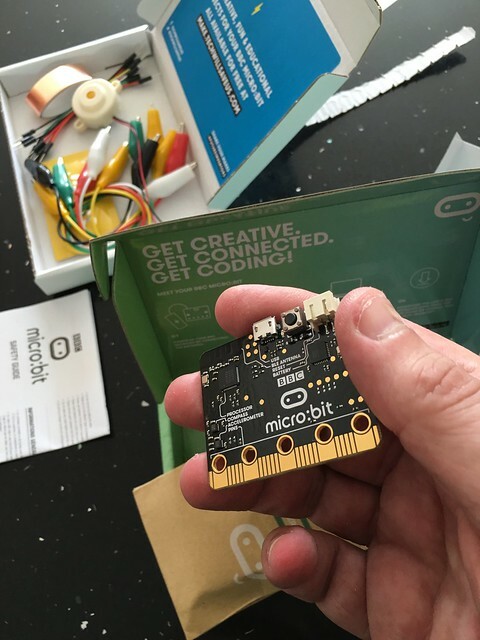 Yes there is a lot of writing but the predlets still need to get the opportunity to learn their craft and this morning my/their BBC Micro:bit arrived. A fascinating Arduino like controller but loaded with LED’s, compass, bluetooth and gyroscopes. It will be great to see what they get up to with it. 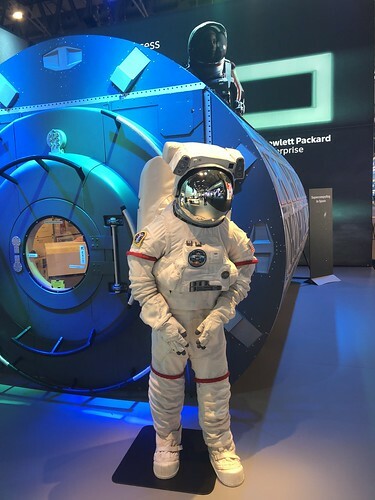 It is a full IoT endpoint when it comes to it. Another addition and a rather fantastic one was my Father’s day present of next generation slot(less) racing with Anki Overdrive. 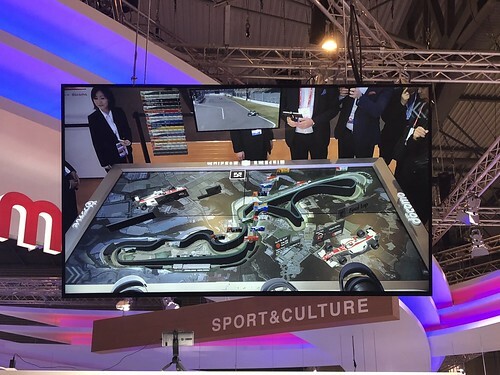 These fascinating cars read the track as they race on it, making any layout they will autonomously drive around mapping the reach first they you get to race using you phone/tablet. Switching lanes and controlling speed and virtual weapons and defences. They are fast and frenetic, and when they go off track they razz around trying to find it again. Watching the robot cars drive is pretty magical too. I know how they work, I know what they are doing, but…. wow. Once again another IoT style twist in the tail. Alluding to where the World is going, first liberating the ideas from play, just like Pokemon Go has. If you want to see the diverse list of 451 Research reports I have been doing look here, thats not including all the press articles and conferences presenting I have been up to in just a few short months. I had a trip to Jersey this weekend, sponsored by Jersey BCS so that I could be an out of town judge at the #hackjsy game development event. The focus here was for teams to build something in 36 hours, game related. With my BCS Animation and Games specialist group hat/badge on it made a lot of sense to to and see what was going on. I also treated the trip as a re-aquanting myself with travelling on business, the family getting a chance to see I am now there all the time, but just for a short first stint. I also thought I would test out the new clothes for travel comfort. That test worked, but in a way I was not expecting. I usually have been wearing combat trousers and my phone sits nicely in the leg pocket. Instead it was inside my new jacket/ waistcoat arrangement. 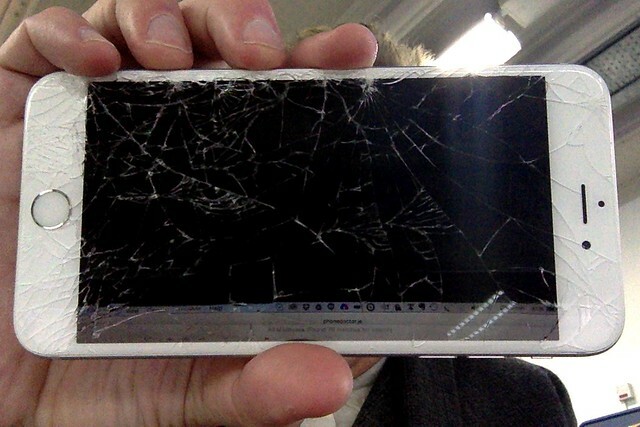 As i parked the car at the airport and hoofed my overcoat on with a hunch of the shoulders, my iPhone 6s plus felt the urge to slide upwards out of the shiny new pocket and propel itself face down onto the floor. I knew it was not going to be too well but I was surprised at just how smashed it made itself. It was completely unhappy with any sort of interaction. I couldn’t power it off with a slide either. I tried the power and home button together for a few seconds and it shutdown. The Jersey flight is inly 40 minutes in a turbo prop but they don’t like phones being on. It is not so bad these days to be without a phone as if you have a laptop/pad etc wi-fi is readily available, so I let home know I was not going to be texting and Jersey know I was not going to be ignoring them if they called. Whilst there I got to talk to a lot of people from all over the island in different industries. It was great to catch up with the guys from vizuality as they are making huge strides in the areas of installation experiences using VR. Tracking users in a 10x10m space and providing headset visuals as they wander around. I spent the Saturday hacking too. I looked a little in IBM Bluemix and its Unity api for text to speech, using my own book quotes to see if it could cope. They all still have trouble pronouncing Roisin though 🙂 I also then spent a bit more time on my Vuforia AR covers for the books. I decided that Reconfigure should have the variant of the block world view that Roisin sees and builds in her own Unity application. Then on Cont3xt I explored writing a scene changer, so at certain intervals the models and view would swap. Initially I did that by toggling the image targets, but that did not trigger the re-viewing of them, as it expected the same target to have the same stuff on it. However, swapping the game objects attached in the tree, turning them on and off worked, just as the animation works. So I now have a little bit of authoring infrastructure that makes it easier to add multiple scenes and play through them. 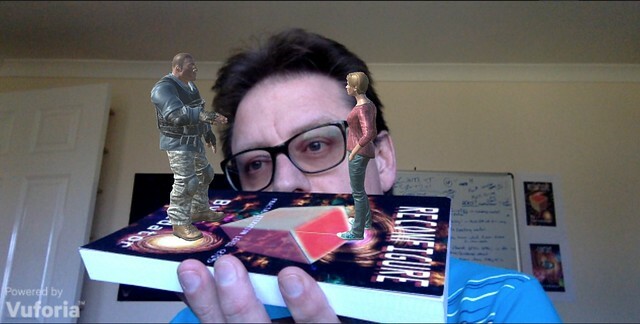 I was going to do something with the leap motion sensor too, but that fitted more with having an AR headset to interact with the book covers, with a broken phone and other judging work to do I parked that one. I also had a lot of conversations around IoT in various forms, and a bit of a chat about blockchain too. Jersey may only have 100,000 people on it, but there is a vibrant tech community there. 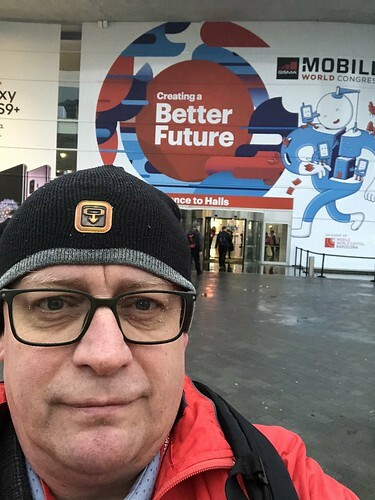 It was a great trip, and the phone is now repaired (the Jersey shop wasn’t able to do 6s plus so Apple Basingstoke did it in 1 hour) It also now has a proper case. I had avoided that for ages, not having broken the phone before. 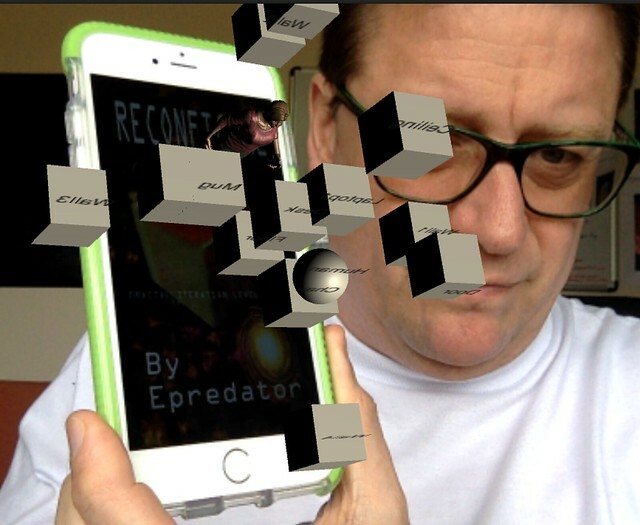 Rather than take a picture of the phone in a mirror to show the case, I sparked up the AR unity, put the Reconfigure picture on the phone and then the mac did its thing and rendered Roisin, holding her phone with a view of the world that she sees. Anyway, well done everyone at #hackjsy, great organization, great participation, great fellow judges and a great island. See you all again soon I hope. 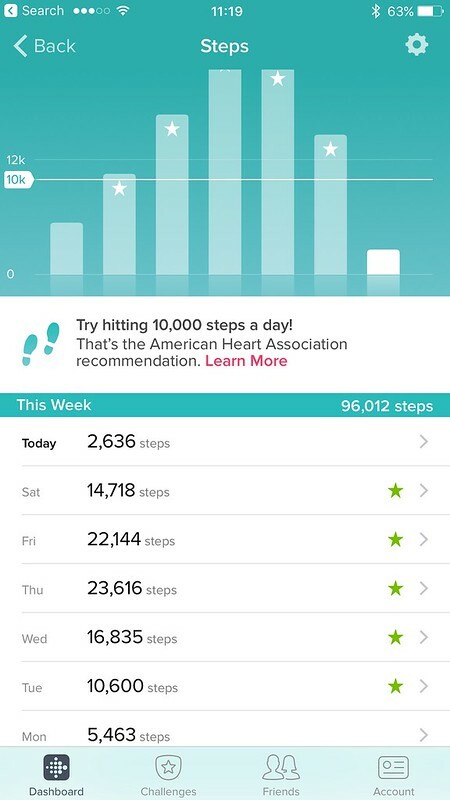 Yesterday I popped along on just an expo pass to London’s Excel centre for the Wearable Technology show. Despite its name it is not all about wrist watches that check your heart rate. 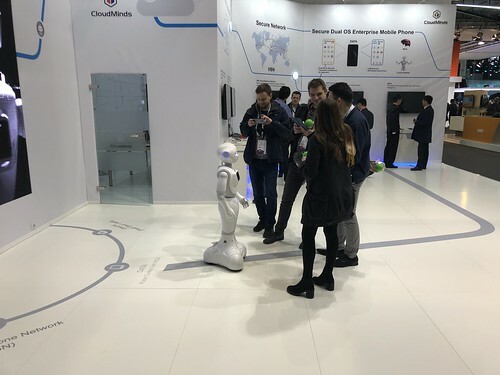 The organisers have recognised the wider implications of things getting more instrumented, more data flowing and more business opportunities in the Internet of Things industry pattern. I had several reasons to pop along, the main one there will be a little more on later. I alluded to some big changes in a tweet. I don’t mean to tease but I am going to anyway. 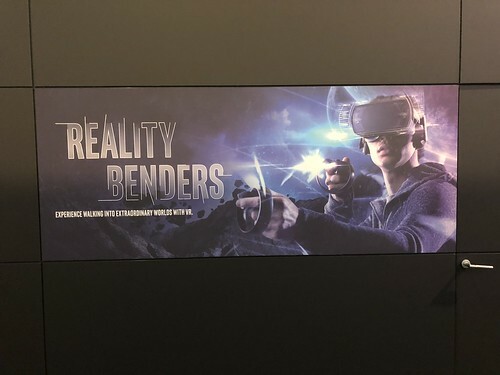 Another reason to go, just in general because it’s what I have worked with for years is the VR and AR aspects of the show. There were a lot of headsets, both full immersive Rifts, Gear VR and also lots of peppers ghost, not really a hologram, heads up displays. There were some interesting uses to track warehouse goods in a HUD and also using projection onto a surface to avoid the need for glasses at all. 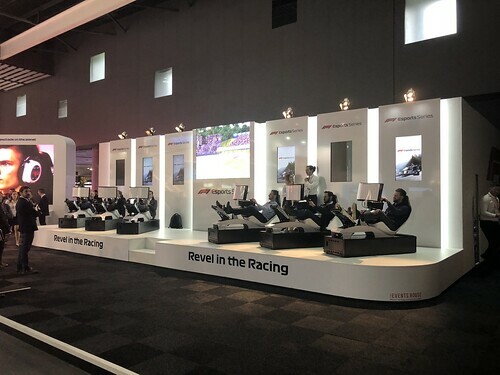 The economist had a stand showing a great use of virtual worlds. They have a reconstruction, from photos and other data, of the Mosul artefacts that have been destroyed due to the conflicts in the middle east. The VR was a little old fashioned, but the principle and content was good. I thought it would be interesting to revisit some of the Augmented Reality tools that have Unity3d packages for them. The first I headed for was Vuforia, now owned by PTC. I am using the free version. It all worked straight from the install, though there are a lot of features to tinker with. I wanted to use an image marker of my own, so naturally I used the book cover. There is a lot of AR and VR in the story so it all makes sense. For the 3d models I used the current trial of Fuse/Mixamo now part of the Adobe. It lets you build a model and export it in a nice friendly Unity3d fix format. You would be suprised how these various formats for models and animations hide so much complexity and weird tech problems though. Eventually I found a couple of animations that fitted the mood. This is not a full action sequence from the book, but it could be. I have some more vignettes in mind to experiment with. I am just upgrading my windows machine so I can use the Kinect 2.0 for some of my own motion capture again. Finding the right animation, and then trying to edit it is really hard work. The addition of motion, especially in humans, hits a different part of the brain I think. It makes lots of things look not quite right. So here is the video of augmented reality on a cover of a physical copy of an ebook novel telling the story with lots of augmented reality in it, if thats not too meta. Roisin rather sassily taps her for while the Commander lays down the law to her. Reconfigure and Cont3xt are available right now to enjoy, and if at all possible, PLEASE write a review on Amazon, it makes a massive difference to the take up of the books. 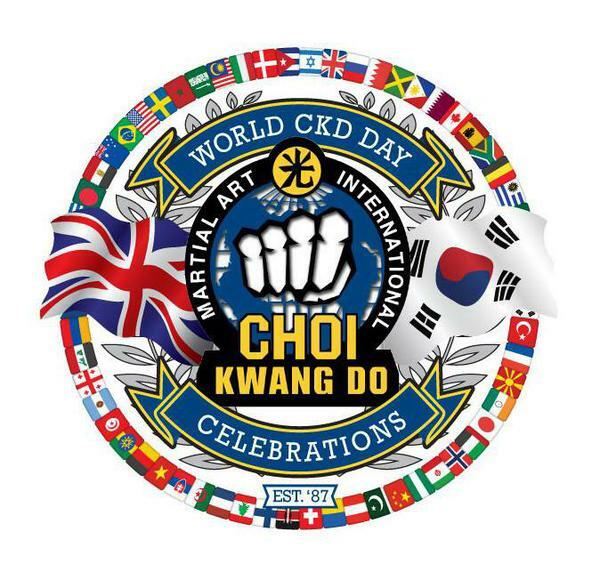 This week is, for our martial art, Choi Kwang Do, starting to be known as World CKD week. Primarily that is because March 2nd is the anniversary of Grandmaster Choi founding the art, originally in 1987. The week is being themed with the tag line Science meets Martial Arts. This is one of the main reasons Choi Kwang Do works for me. In class we learn, practice and teach things based on the reason they work. All this has led to Choi Kwang Do being a huge part of our family life and we have made so many good friends through it. There is a bond we all feel in the positive spirit of the art. It was shown this weekend as we celebrated with Master Scrimshaw the 5th Anniversary of BasingstokeCKD Our dohjang was full on Saturday with fellow students from Basingstoke, but also some good friends, old and new from other schools. We had black belt tag grading, colour belt grading, an incredible set of routines to go through in class and then a great social event with food and cakes. It was incredibly uplifting, and an ideal lead into World CKD week too! To celebrate this World CKD week I have made Cont3xt free to download. It has an awful lot in it, pivotal to the story inspired by Choi Kwang Do as an art and a state of mind. It fits with the Science (Fiction) meets Martial Arts tagline for the week. Whilst I am doing this to encourage my fellow practitioners to see ways we can introduce Choi Kwang Do in many different ways, and as a way of saying thank you to them all there will of course be other people able to download and experience the books for free. All my author bio’s mention Choi Kwang Do. We pledge Humility and Integrity, amongst other things, in the art. So promotion of one’s own work like this could feel a little uncomfortable. However I really want to share how CKD inspired elements fit into a science fiction techno thriller in a very positive way. It was the just getting on with it unbreakable spirit that we learn, that even got me to write these two books. As Cont3xt is the follow up book I have also made Reconfigure free for the week too. The martial arts arrives in Cont3xt but not in the way you might think to start off with, in Reconfigure (book 1) Roisin has no such skills, but the book is there for free too for completeness. I hope a few people get a chance to take a look, maybe even pop a few stars of reviews on Amazon. I would also love for someone to have read the Cont3xt, who doesn’t do CKD yet, and to look up the art , find their nearest school and start to train. It’s a long shot, but every person in the World is a potential student to join us, have some fun and learn something really useful about themselves. So there we have it, the books are available free on Amazon, to be used in whatever way works for whom so ever needs it. Cont3xt and Reconfigure here. There is a countdown running and people are showing their excitement. This time, not to an enclosed virtual reality headset but for a full computing platform Augmented Reality headset. It is Meta @metaglasses. I have talked about and written a lot (including the two novels!) 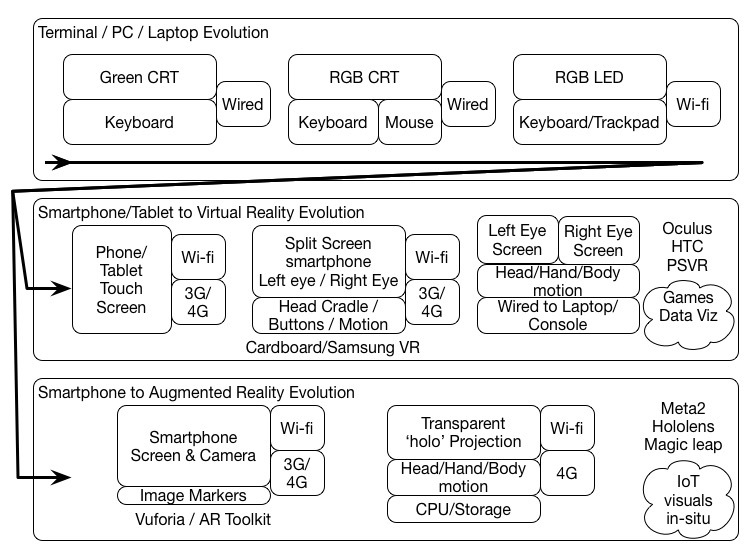 about augmented reality and what it means when it is done properly. This teaser video features many luminaries of tech, pop culture and business evangelising the product based on the demo they have seen. Scoble seems particularly gushing about it. He posted an hours worth of that on Facebook after his intro demo, but as its all embargoed he could only talk generally. With Hololens, Magic Leap and now Meta (assuming it is in the same category which at $600 – $3000 it will be) and of course my own fictional EyeBlend there is a lot going on that may leap frog the VR wave this time around. This has been around and developing for a while. It was initially seeming to have to answer itself to Google Glass which was really just a heads up display not full AR. The early video show bug eye aviator inspired glasses but the latest pictures are more visor with a noticeable sensor bar. will.i.am seems pretty interested in it to. As he says it opens up the possibilities for the arts. So maybe he will help me make the blended reality movie or series for Reconfigure? 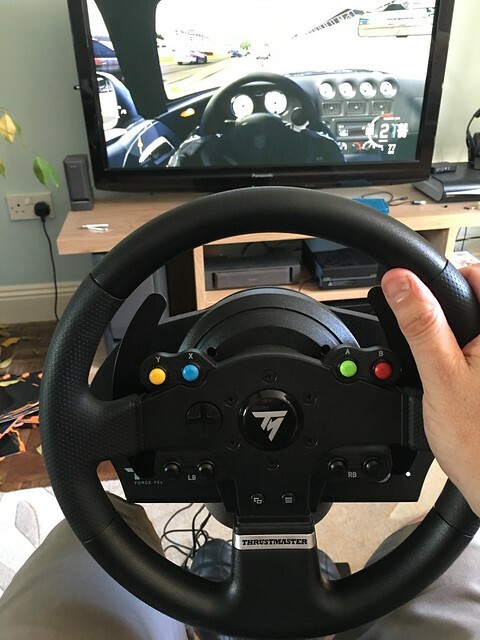 This sort of kit goes past what we would call gaming and entertainment as it provides realtime feedback of the World and the Internet of Things. Helping us see the stuff we can’t see normally, but in situ. Again with Meta it will depend on how they build the physical model, or if they do, of the World in order to implement the digital in place views. 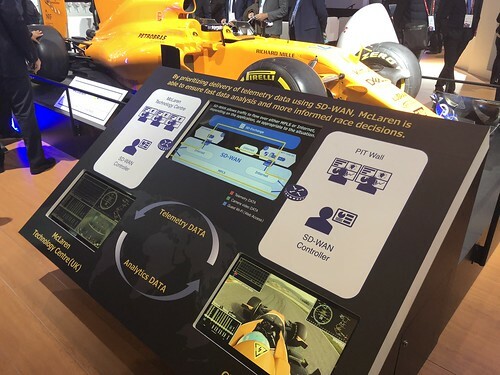 Some earlier videos show the use of real world objects, a flat surface such as a box, being used as canvas tracking and a reference point for the digital content.